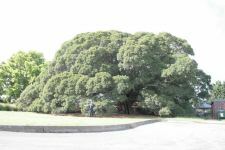 Tree condition and general remarks: Incorrectly known as �The Old Moreton Bay Fig� Feature tree in reserve. 25m from Highway. Footpath within the dripline on two sides of the tree. Mulched to dripline. Popular climbing tree for the kids. Tree in very good condition.